"Fire" was a pretty popular track back in 1997, boasting one of the first big hits to combine rockin' electric guitars with groovy dancing "techno" beats. It was even prominent enough to appear overseas in the soundtrack to "Mortal Kombat: Annihilation" during a fight scene. As was Scooter's way during their self-proclaimed "First Chapter", singles generally received remix discs. "Fire" is no exception, so here's a look at the remixes! First up is the D.O.N.S. Burn Rubber Video Edit, mixed by the legendary German dance duo of D.O.N.S., most notable for revitalizing the classic "Pump Up The Jam" for a new generation of boogie-ers. This track starts with a focus on chopping and rearranging the lyrics of MC H.P. Baxxter over a standard beat and bass combo with some synths overtop, sounding similar to a joyous car horn. That's pretty much the gist of the entire song, save for a break featuring the pluck, an instrument used incessantly throughout 1997-1998 dance productions. However, it's fairly catchy and significantly full of energy. Next is the Klubbheads Remix, and this one's far more house-based. Using some cool disco samples and, later on, that aforementioned pluck synth, the Klubbheads have managed to create a new sound for "Fire"... and most assuredly a repetitive one. The main melody, if indeed there is one, gets dull within the first ten seconds -- it's pretty monotonous and seems to be bereft of any strong effort, sadly. The D.O.N.S. Burn Rubber Mix is essentially a widened version of the previous Video Edit, adding very little else except an extended beat intro. 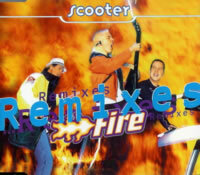 To conclude, Scooter has added its own B-Side with Fire Dub 2, a retooling of some of the instrumental elements from the original. If you enjoyed the synthetic, non-guitar-based parts of the song, you'll like this since that's the focus, although some muffled guitar riffs appear briefly as well. It also features some H.P. lyricisms as well, so don't feel like you're shortchanged there, either! "Fire" was never my favourite single, and this remix package does very little to improve my perception. The D.O.N.S. Mix serves as a nice addition, but the Klubbheads version is dull as all hell and the Fire Dub 2 offers nothing new except for a re-arrangement. It seems like Scooter's having bad luck with remix discs, as I have yet to find any real gems on them. Maybe you're better off just taking the main road and enjoying the singles as they were originally intended to be heard.